“It’s the application of the product,” she said. “You’re not applying it correctly. You need to start at the bottom, wiggle the applicator, and then pull it straight up to the end like this.” She wiggled, flipped, and curled her index finger up to show me how. When I got home, I did exactly what Gwen said…and my eyelashes looked totally different. Better. Then God spoke to me through this silly, girlfriend conversation. I realized that application is the key to more than my eyelashes. It is the key to life. I can read God’s Word from cover to cover, go to Bible studies year after year, and read Christian living books stacked high. But unless I apply the principles properly, they lay dormant in my soul. I won’t be any different than I was before I did the study. I won’t act any different than before I read the Word. I won’t feel any different than before I underlined and highlighted that inspiring book. Can you imagine what the world would be like if we God-fearing people actually applied what we learned? Here’s what I want you—and me—to do today. Think back to the last five principles you learned from reading a devotional, a book, a Scripture, or hearing a sermon. Then note how you have applied that teaching to your life. If it’s too hard to remember what you’ve learned, start today and write down the next five principles you learn. Keep the list, then go back in a few weeks and note how you applied the truths to your life. 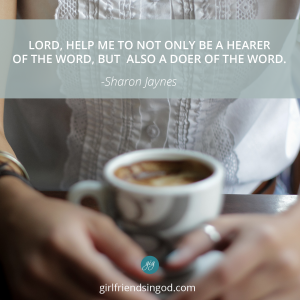 Lord, help me to not only be a hearer of the Word, but also a doer of the Word. Show me when I am not applying Your principles correctly. Convict me when I walk away from a powerful message and continue living the same old way as I did before. Help me to move Your Word from my head to my feet as I walk through life. I’ve already given you your challenge for today. Make your list. Then go back and note how you applied new truths to your life. January is always full of New Year’s resolutions. One of mine is to pray more diligently for my husband. If you’d like to join me in impacting your marriage and your man in the most powerful way possible, check out my book, Praying for Your Husband from Head to Toe: A Scriptural Guide for Daily Prayer. It shows you how to cover him in Scripture-based prayer from his head—what he thinks about—all the way down to his feet—the path he takes. Perfect !!! I woke this morning regretting a truth I knew but didn’t follow. This couldn’t have come at a better time Thank you so much . God bless. For the love of our Famous Kin, Jesus! I am a follower and a fan of HIM!!!! I am determined to memorize a new piece of scripture each month this year and apply it to my life. I decided to start with 2 Timothy 2:15 study they word to show thyself approved unto God, a workman that needeth not to be ashamed, rightly dividing the word of truth. God used this mail to speak to my lean soul.Thank u. It was a typo – it should have read, “Friend to Friend.” Blessings! I may be the exception, but I think that you are missing one thing. I guess that I don’t see any major changes from my devotionals and study time. I think that they PREVENT changes. I am a mentor for a high school robotics team. God has confirmed that He wants me there too many times to doubt. I love the kids and the team, but its sometimes HARD. From finances (we need to raise our own support), to recruitment, to getting them to do the work, its often a struggle. There are days that I want to run away. It’s only through those times in the word, alone and with others, that I can “keep on, keepin on”. It’s God’s way of confirming that this is where He wants me, and giving me the strength to go on. Its amazing how God speaks to us. This is something I have been working on, but slacked off on yesterday. Last night, I was not happy with myself. Now, I’m looking at the same thing I have been working on. Just a reminder, not to lose myself in life and to make sure I continue to grow closer to Him. ik of anything so just looked back on a few past sermons our pastor did and this one came to mind bout blessings. I will try the mascara, I never could get my hair to feather like Jaclyn Smith, and the teen aged boys could. Yes, definitely, need to be a doer and not hearer. That has worked against a lot of people I know. Myself, included.